Jake and Windy had a nice Thanksgiving at their grandma’s house. Today we hit Petsmart for Christmas presents. Unfortunately, the furkids were left at Grandma’s; however, they didn’t take carpet revenge. Don’t tell them they will get new beds, toys and treats. 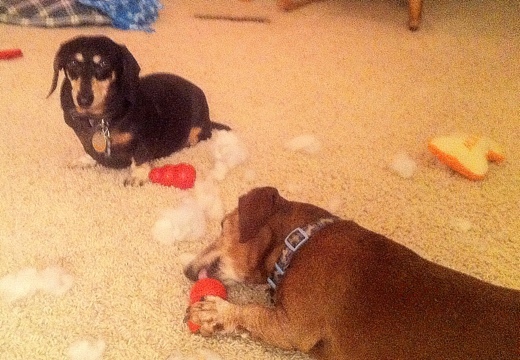 This entry was posted in Dachshunds, Dog Behavior, Dog Toys and tagged Dachshunds, toys. Bookmark the permalink.